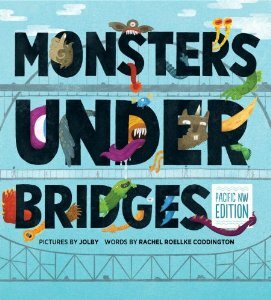 From Portland, Oregon to Seattle, Washington to Vancouver, BC, this playful picture book introduces misunderstood monsters and the Pacific Northwest bridges they call home. Meet Irving the Noble Vegetarian who lives under the Astoria-Megler Bridge and smells like vegetables and hair gel. Or the Flixies, a group of winged pixie creatures who live under the Fremont Bridge in Portland. Each monster takes on the history and environment of their home, making Monsters Under Bridges engaging as well as educational. Find out who these lovable monsters are, how they spend their time, what they like to eat, and more in this fun monster almanac! I love this book because I've lived in the PNW for most of my life, and I have been across many of the bridges in the book. In fact one of the bridges is one that my brother and I were fascinated with as kids and reading the story about it made me smile and brought back fond memories (It's the Bridge of the Gods, in case you're wondering, Mom). The book is a wonderful combination of funny stories about the monsters, history about the bridges and their construction and design, and sometimes even a legend or two that go along with the bridge. As for the kids, they loved looking at the pictures of all of the monsters that live under the bridges. Who knew our bridges were such exciting places! I know this is a book that we're going to continue to enjoy as the kids get older and we travel across the bridges in the book! The book comes out on May 7, 2013 and is available for pre-order now. Happy reading! Disclosure: I received a copy of this book from Sasquatch Books so that I could review it for myself. I was not compensated in any other way and all opinions posted here are mine and mine alone.